Comments on "On The Street.........Martin, NYC"
is this the same Martin that you shot with a wonderful I think it was Demeulemeester jacket and YSLbag some time ago? Love the boots and the composition of the shot. For me this shot is all about the backdrop. The clothes aren't so memorable. Aww - shot at The Greenhouse. Forever shuttered? I'd like to see the rest of her t-shirt. 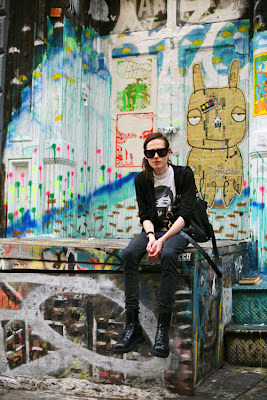 Great NYC shot--angular Martin floats in graffiti! this is a great photo. I was actually just thinking that we need to see someone more gritty, less shiny & new. Wait, you mean that isn't Jennifer Garner? I'm so confused. Is this a guy? Either way, this person looks cool. Love the t-shirt and the glasses especially. But it's amazing, the pictures you take ... of youngsters against the grafitti. Bravo! oh martin.... YOU'RE SO DREAMY. Good lord and sweet baby Jesus I cannot stand those Harry Carey (sp?) windowpane sunglasses anymore. They are so 2001. Yeah so they were all the rave in Italy years ago...Its time to get over it already. She's cute, the pictures is great, but those stupid sunglasses ruin it for me. The background is interesting and the guy just melts in. anon 12:40 -- "She's cute"
This is the only way to wear skinny jeans, I think. Accessorizing with a wall...very clever! Cute...but a little ordinary. -Frugalfashiongirl. OK, i love that look. I thought he was a girl until i read the comments. that makes him even more interesting. what he's wearing really does not matter as much as his demeanor and message do. he wants to make a statement, and he is oh so successful at that. great hair! great skin! fabulous outfit and boots to die for! hot guy! fully! i love the shirt but i think i just love tees.. I love this photo! It's such an interesting contrast between the colored wall and the person sitting in front of it. She sure is a fabulous he. I love this, but I could do without the t-shirt design; it makes the whole outfit look cliche. But the rest is great. And she has fantastic legs! It's really a cool photo. The look, fashion, and art direction is such that it is classic in the sense that nobody could ever name the decade of this photo. All they could say is that it was post 1980. Yes, this is the same androgynous Martin who you photographed toting the Yves Saint Laurent bag. I thought he was beautiful then, and though starkly contrasted from before, i like him here also. The skinny jean and army boot is so outrageously well done, love the bag and cardigan. Martin's whole deal is androgyny, how far can he push the gender line, I love. Work! Furthermore, I do not think androgyny is celebrated any more or less in the fashion world than in previous years. I just think people find it so interesting when it does done correctly. Especially when one does not try to do it, does it naturally. his last picture has been my favorite for a long time, its good to see another outfit of his, whith an awesome background as well. love everything about this image. the backdrop, the way he's seated, and those sunnies! She kinda looks like Jennifer Garner.. she looks so cool..
i love the cat on the background, looks so stoned or high. even as if it says "bla bla bla whatever"
What a fantastic picutre, Mr. Sart! I looove how the backgrounds in your photos always go perfectly with the models and their outfits, but this is simply amazing! i like the androgyny. i like the background even more. I really love the background scenery - great shoot! waittttt so is it a guy or girl anyway?? im so confused! he or she is attractive nonetheless! also do you think you could please post the link of his/her first photo? best shot i've seen here so far! Can anyone please tell me where the bag is from? interesting to be sure- but the mural she is sitting infront of is much more absorbing than the look/outfit. That print on her shirt. Is the graffiti by Jean-Michel Basquiat?